The presence of a baby is a gift to parents, but it can also confuse parents, especially the first time to have children. One that is often experienced is confusion in choosing a good baby diaper. Parents must always want the best for the Fruit Heart, from the tip of the hair to the toe. Baby care products and baby gear such as clothes and shoes should be chosen as well as possible. No exception for baby diapers that come into direct contact with the skin of the baby. Choosing a good baby diaper can be a complicated issue for parents. Baby diapers are now not only made of cloth, but there are also disposable diapers that can be immediately discarded. Parents may be wondering whether it is better to choose cloth diapers that must be washed every time dirty, but safe for baby skin, or disposable baby diapers that although practical, could cause a rash. Cloth diapers are now available in a wide selection of attractive designs and colors. Even now there is a baby diaper from cloth that uses adhesive or buttons. The shape and size also vary so that can be adapted to the Small body. Cloth diapers can also be said to be cheaper and less costly than disposable baby diapers because they can be washed and worn again. Cloth diapers can also be stored and reused for your second child. Expenses to buy diapers for a second child are reduced. Cloth diapers are considered safer for baby's skin as they are free of chemicals. In addition, many parents may choose to use baby diapers from fabric because they care about the environment. Using cloth diapers means you reduce the waste that is discarded. These baby diapers do not escape the other deficiencies, such as easy leakage, have to be replaced frequently, and not completely practical to carry everywhere. In addition, cloth diapers take a lot of time to wash and dry. The mother needs to take the time to wash and dry cloth diapers before it can be reused by the Small. When using a safety pin to place a diaper, select a large pin with a plastic head. Be careful when installing it so as not to hurt the baby. Wet cloth diapers exposed to baby's urine can be placed in a dirty laundry basket, but cloth diapers are dirty because the feces should be cleaned first. You can spray diapers with a mixture of water and baking soda to control the odor. When washing cloth diapers, separate them with other clothing and use special soft detergents for babies. This detergent is safer to use by babies who have sensitive skin and do not cause allergic reactions. Use hot water and rinse at least twice. Do not use fabric softeners that can cause a rash in infants with sensitive skin. Always wash your hands after changing baby's diapers to prevent the spread of germs. Disposable baby diapers are the choice of many parents because they feel more practical and easy to use. These diapers also contain a fluid-absorbing gel that can hold more fluid so it does not need to be replaced frequently and is not easy to leak. The gel also keeps the baby's skin dry and not so wet that your child is comfortable. 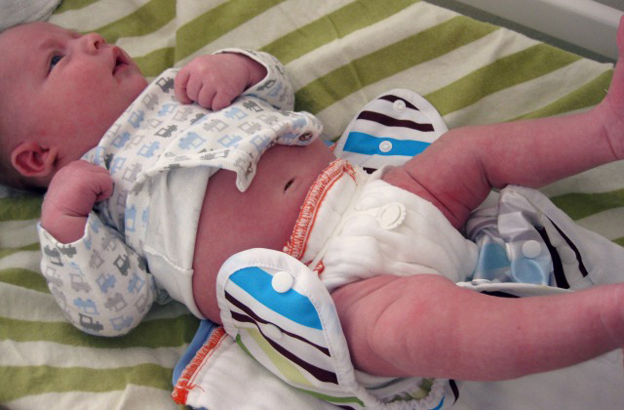 Some disposable diapers are also made with materials that allow air flow to the child's skin. It takes more money when using disposable baby diapers than cloth diapers. Disposable diapers should be discarded after being dirty and can not be reused or stored for later use. Disposable baby diapers contain chemicals, such as polypropylene, for the inner layers that touch the child's skin. In addition, disposable diapers also use materials for paper and superabsorbent polymers, which can absorb urine in large quantities, The material is considered safe for small doses. Some types of disposable diapers also contain additional dyes and fragrances, sometimes these additives can cause allergies in infants. If there are rubber marks around the groin and waistline, this may be because the diaper is too tight. Loosen or buy diapers of a larger size. Always wash your hands after changing a child's diaper to prevent the spread of germs. The trash should be emptied regularly (about once a day) to prevent the occurrence of unpleasant odors and bacterial growth. Diaper rash can occur due to a fungal or bacterial infection, wet or dirty diapers that remain in use, friction between the skin with a diaper, or an allergic reaction to the diaper. Therefore, diaper rash can be prevented and resolved by immediately changing the diapers when wet or dirty, cleaning the skin of the Small with water and a clean cloth, and applying cream or ointment before the Little is dressed. In addition, Mother or Father do not forget to wash hands before and after changing diapers. The sensitivity of baby's skin and adult skin is different. Therefore Mother and Father need to pay special attention if you want to buy baby diapers. Choose baby diapers of the type, material, and size according to the Little One, to keep him comfortable and his health is maintained.